Ann Earl was feeding her three children fresh pears one day when she noticed they weren’t eating the peels. She started describing antioxidants to her 4-year-old daughter as the “good guys” that go after the “bad guys” in her body. As a graduate of the BYU exercise science undergraduate and master’s program, Earl discovered her passion for teaching her young children to eat healthily. Earl took a leap into the entrepreneurial world to start her business, Healthy Kiddos, even with three young kids begging for her attention. Earl is married to Adam Earl, and they have three young children: Ellie, Jensen and Alice, with twins on the way. Ann said her family is the highest priority in her life and nothing could change that. According to her husband, Adam, Ann Earl has always had a passion for healthy living. After Ann Earl’s experience with the fruit peels, her kids kept asking about the nutrients in the fruits and vegetables they were eating. Ann Earl said it was difficult for her to remember everything and bringing out her phone to do a quick Google search wasn’t always the most practical option. Ann Earl searched for a product she could buy to have around at dinner to educate her kids about healthy foods, but she quickly discovered such a product did not exist. “My husband suggested I come up with a product that would provide information for moms and caretakers to help even picky eaters improve their eating habits,” Ann Earl said. Shortly after this experience, the Earls did everything they could to bring their product to the table. After many late nights of brainstorming, the Earls decided to create two different products: reusable plates and flashcards. The Earls had barely finished their product when they had some new neighbors over for dinner. Ann Earl brought up the plates at the end of the meal. As it turned out, their neighbors, the Smiths, happened to be meeting with a former senior vice president of Walmart the next day and asked if they could take the plates to show him. 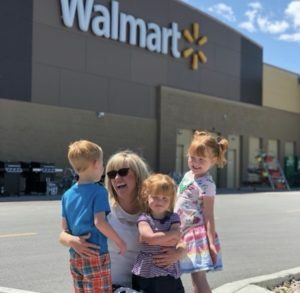 As Smith predicted, the product was a hit with Walmart, which launched the Earls’ entrepreneurial journey with Healthy Kiddos. The mission of Healthy Kiddos, according to Ann Earl, is to give kids a reason to eat healthily. Each one of their products is built around that mission and details the vitamins and health benefits of particular fruits or vegetables. There are six different fruit plates and six different vegetable plates. 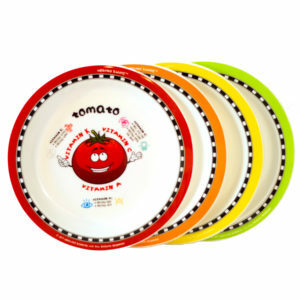 The plastic plates are dishwasher safe and BPA-free. 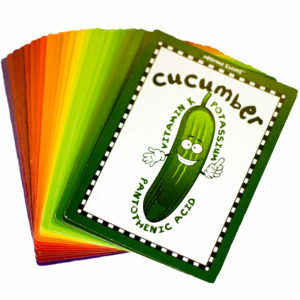 The flashcards come in a pack of 24, with 12 vegetables and 12 fruits. Healthy Kiddos products can be found online at Walmart and Amazon. 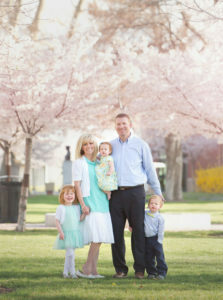 Ann Earl faced the feat of starting her own business without any business background, but her husband is a graduate of the BYU MBA program. Ann Earl has expertise in the product’s subject, and Adam Earl is more entrepreneurial minded. Despite the demands she faces, Ann Earl said she continues to keep her priorities aligned with her values. Adam Earl said he thought they would be much further along in the process than they currently are. Ann Earl said she felt joy after hearing from customers that her product is helping their kids finally eat fruits and vegetables. Ann Earl said Healthy Kiddos’ success didn’t come overnight, and it took longer than expected to get where they are now with their company and sales.